St. Catherines, Ontario, Canada. Publisher: The Radiant Healing Centre. Editor: Jennie O’Hara Pincock; F.E. Hetherington, 1935. 1/1, 1932. $1.00 a year, which included membership in the Radiant Healing Center and "any helpful instructions that may arise during the year in the Mother Centre." The Centre practiced daily "withdrawal into the Silence, and a twice monthly concentration (simultaneous with the meeting of the Mother Circle)," and would send private instructions to members on request. 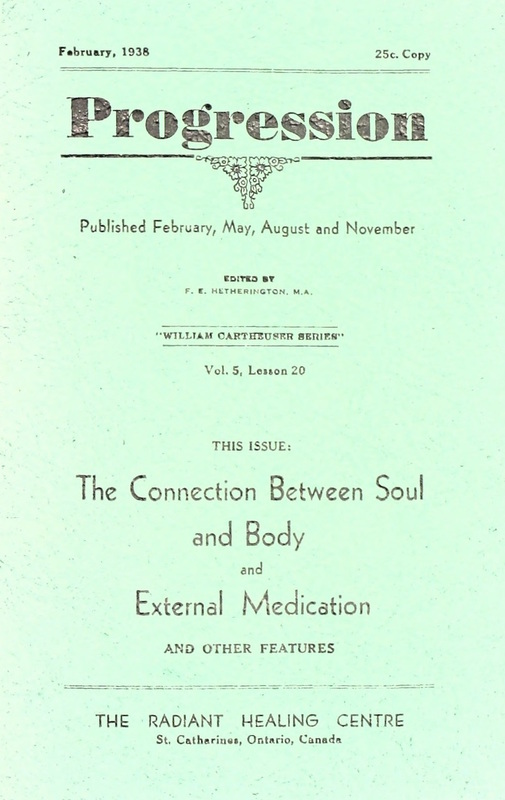 Pincock had earlier written Trails of Truth, her verbatim account of seances with the independent voice medium William Cartheuser, and the first issue of the journal, called the "William Cartheuser Series" on "Healing and Self-Unfoldment," was written (and copyrighted) by him. Cartheuser's earlier success before the A.S.P.R. in 1926 was somewhat dimmed when one of his communicating spirits was found to be alive. Pincock broke with the journal in 1935 after realizing that Cartheuser's mediumship was fraudulent. Skidmore Library, Lily Dale.